For all have sinned, and come short of the glory of God; Being justified freely by his grace through the redemption that is in Christ Jesus: Whom God hath set forth to be a propitiation through faith in his blood, to declare his righteousness for the remission of sins that are past, through the forbearance of God; To declare, I say, at this time his righteousness: that he might be just, and the justifier of him which believeth in Jesus. For when we were yet without strength, in due time Christ died for the ungodly. For scarcely for a righteous man will one die: yet peradventure for a good man some would even dare to die. But God commendeth his love toward us, in that, while we were yet sinners, Christ died for us. 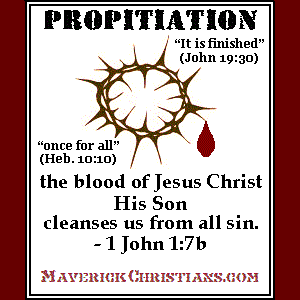 Much more then, being now justified by his blood, we shall be saved from wrath through him. I speak after the manner of men because of the infirmity of your flesh: for as ye have yielded your members servants to uncleanness and to iniquity unto iniquity; even so now yield your members servants to righteousness unto holiness. For when ye were the servants of sin, ye were free from righteousness. What fruit had ye then in those things whereof ye are now ashamed? for the end of those things is death. But now being made free from sin, and become servants to God, ye have your fruit unto holiness, and the end everlasting life. For the wages of sin is death; but the gift of God is eternal life through Jesus Christ our Lord. There is therefore now no condemnation to them which are in Christ Jesus, who walk not after the flesh, but after the Spirit. For the law of the Spirit of life in Christ Jesus hath made me free from the law of sin and death. For what the law could not do, in that it was weak through the flesh, God sending his own Son in the likeness of sinful flesh, and for sin, condemned sin in the flesh: That the righteousness of the law might be fulfilled in us, who walk not after the flesh, but after the Spirit. That if thou shalt confess with thy mouth the Lord Jesus, and shalt believe in thine heart that God hath raised him from the dead, thou shalt be saved. For with the heart man believeth unto righteousness; and with the mouth confession is made unto salvation. For the scripture saith, Whosoever believeth on him shall not be ashamed. For there is no difference between the Jew and the Greek: for the same Lord over all is rich unto all that call upon him. For whosoever shall call upon the name of the Lord shall be saved. Pray to God right now and ask Jesus to be your Savior! Feel free to email us at contact@maverickchristians.com. Copyright © MaverickChristians.com All rights reserved.